As voice-operated assistants like Amazon Echo multiply in households across the globe, smart brands will need to rethink the bullet points on their product pages – because how they sound will become as important as what they say. Bullet points are well-established as the “above the fold” home for information about a product’s features and benefits. Now, they’re also Alexa’s most common source material for product descriptions on Amazon Echo devices. Content26 recently tested a number of products on an Echo and Echo Show to more precisely understand the way Alexa shares product information and to craft tips for optimizing bullets for voice. The task proved a little more complicated than expected. We found that Amazon has created specialized content for some of its best-selling products. In most of these revisions, Alexa simply sounds more conversational when presenting product information. But in some cases, she adds her own quirky or even bizarre, commentary to the mix. When a shopper asks Alexa to search for an item, she will tell them the title and price of the product that ranks first in organic search or has received the Amazon Choice designation. For non-screen Alexa devices, customers can ask “tell me more” to hear details. Alexa will then provide the product’s star rating and the number of reviews. Next, she typically recites bullet points verbatim. Except when “telling more” about certain best-selling products – the top 10 items on Amazon’s “grocery & gourmet food” best sellers list, for example. In these cases, she restates the product’s name and packaging size and provides a version of the information in the bullet points, which appears to be redone to sound clearer when reading aloud. For some products, Amazon Alexa changes the bullets to make them easier to understand. For Echo Show, a “details” button leads to a screen with bulleted information. In most cases, bullets are verbatim what you find on Amazon.com. But in several cases, bullets were shortened to fit the smaller Echo Show screen. It’s not clear what influence brands have over this special content. 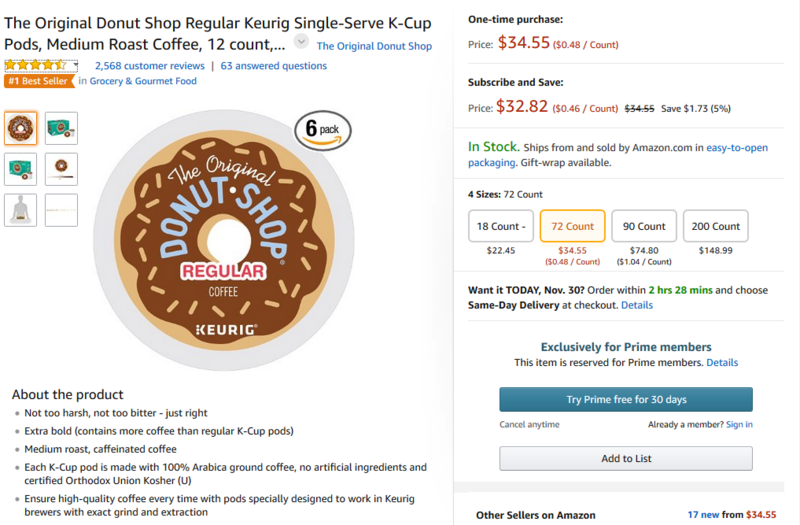 To our knowledge, Amazon is not working with large consumer goods vendors to create and approve special content, although we expect that to change as voice becomes more important to brands. While brands may not be able to alter these “Easter egg” product descriptions, tens of thousands of items on Amazon still have the standard Alexa treatment. Check out the following tips for optimizing bullets for voice – which remains a brand’s best strategy for succeeding on the Echo. Products with short, concise bullet points sounded best on the Echo. Most of Alexa’s “tell me more” descriptions hovered around the 20-second mark, and her bulleted “daily deal” product descriptions run even shorter, averaging 16 seconds. When faced with multiple bullet points and wordy sentences, Alexa selected the bullets she could read within the limited window. She did not always choose the first bullet point. If your bullet is more than one sentence long, by all means, include a period at the end of the sentence. But be aware that bullet points set off by colons or capital letters are challenging to understand. Alexa does not pause when reading a colon or dash, and she doesn’t change her volume or inflection when titles are set off using caps. Without the visual cue provided by the colon, the listener hears, “Alerts on your phone get motion and sound…” Perhaps they’re meant to picture a text alert dancing across their phone to disco music? She nearly always turned “/” into a word, such as “on slash off” or “Works with Amazon Alexa slash Echo Show slash Fire TV.” One exception was the phrase 24/7, which she handled perfectly. Bullet points that start with a subject or a verb are the easiest to understand. “Starts working when mixed with water,” or “Pediatrician and Dermatologist tested” made sense to the ear. This may be because the first three words are not something we’re used to hearing. Conversely, when the Honest Company described its fragrance with a bullet that started “sweet-smelling orange and vanilla,” it worked. While scannability should remain the priority when writing bullet points for the Amazon product page, brands should consider adding a conversational tone where appropriate. Bullet points are vital to providing a positive experience to Amazon Echo shoppers. Brands should revisit their product pages to ensure bullet sections work when reading aloud.